I have received several emails asking what I pack M for lunch. M goes to preschool a few days per week and we have fun putting her lunches together. I am going to start by saying that by no means am I a gourmet, I am just a a mom, and dietitian, trying to please my finicky eater. The older M gets the pickier she has become. What I started doing is including her in making her lunch. We talk about the food groups and what we should try to include in our meals. This meals includes all her favorites. Honey-Cinnamon Sunflower Butter Sandwich, with her favorite veggies, snap peas, baby carrots, and cucumber, cheddar cheese and pumpernickel pretzel sticks, chunky olive hummus, and organic animal crackers. I’m aware that this may look like a lot of food, but as I mentioned… M’s a finicky eater. Out of this lunch she ate a few bites of one half of a sandwich, all the cucumber (her fave), a couple snap peas, all the hummus, a couple pretzels and a couple bites of cheese. She saved the animal crackers to eat when she got home from school. My goal is to post at least one of these per week. 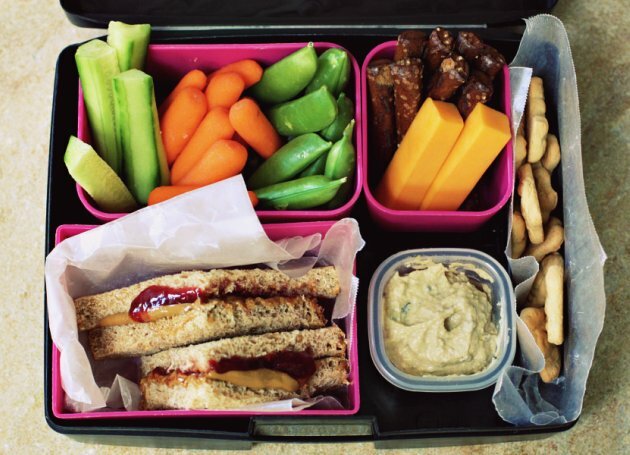 I’d love to hear what you pack for your kid’s lunch! I am always looking for knew ideas. Hi Estela! Where do you find Olive Hummus?! That sounds so good. I can’t wait till I can fix my little man some of these recipes! Your website is great! I would gladly eat this lunch! YUM! I’ve been making my gluten free chickpea oat flatbread for the boys lately smeared with hummus and ham, chicken or turkey for their sandwiches. They also get string cheese and grapes. They don’t get much time for lunch, so I don’t go crazy with it much anymore. Max will sometimes take a salad, but Jay is so limited on time and I’m just happy he gets a balanced meal at all during the day. They both get water in their lunches too for during lunch and to carry with them the rest of the day.